Honeymoon Offer – Stay for your honeymoon and save up to 40% off your room rate. Please contact us for further details. The Constance Belle Mare Plage is golfers retreat in an exotic setting. With two 18 hole championship courses, a spa and gymnasium, four swimming pools and a tonne of amazing activities including underwater walks, kite surfing, quad biking and parasailing, it is fair to say you will not get bored. For the younger guests, the Constance Kids’ Club is filled with activities for those aged 4 to 11. With chic and decadent room decor using natural materials, each room is spacious and flourished with a balcony or terrace. Enjoy the crystal water views from your room, suite or villa or the white sandy beaches; with an array of modern amenities and state of the art technology should you not want to leave your residences for an evening. 6 vibrant bars and 7 exquisite restaurants cater to your every desire providing the perfect setting for great dining experiences with loved ones. 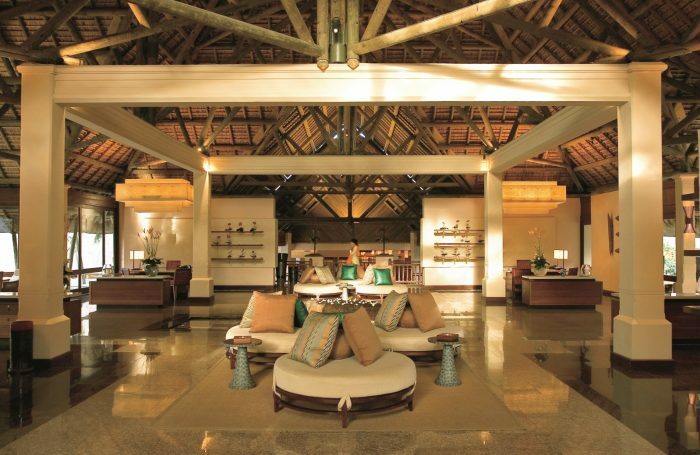 Surrounded by natural beauty at the Constance Belle Mare Plage Resort; this 5 star resort is a dream come true. Early Booking Offer – Book at least 48 days before your arrival and save up to 30% off the room rate for stays of at least 5 nights. Honeymoon Offer – Stay for your honeymoon and save up to 40% off your room rate. There are 4 swimming pools with sun loungers and parasols located around the property. Including 1 heated swimming pool during the winter months, if you need it that is. The Constance Belle Mare Plage is a gem of a property. Surrounded by soft white sands on a private beach, crystal clear waters and lush greens, your every sense will be brought to life. The colours are vibrant, the music a delight and the cuisine mouth wateringly luscious. For a honeymoon couple wanting memories and experiences of a lifetime, the Constance Belle Mare Plage is fully equipped; activities include snorkelling, canoeing, deep sea fishing and speed boat experiences. If you fancy a lazy few days by the pool, the hotel offers four pools to choose from and the evenings spent watching the sun set, sipping beautiful wines and cocktails, with fine dining experiences throughout the resort. With a serene spa, scenic views and amazing activities to choose from, the Constance Belle Mare Plage is a honeymoon couples’ tropical paradise. You will be spoilt for choice with 7 restaurants to dine. Blue Penny Cafe brings sophistication to your table. Accentuated by the fine setting, the Wine Cellar hosts some of the finest wines from around the world, a wine connoisseurs’ dream come true. La Cintronnelle – Live cooking stations only add to the glory of this restaurant, with the chefs having themed evenings to enhance your experience of the chosen cuisine. La Spiaggia – Decked flooring on the beachside, this restaurants serves treats from around the world, including Mediterranean bites and sushi. 2 beach restaurants are well located so you don’t have to move from your sun bed, serving an array of meals including salads, sandwiches and the sweetest of desserts. For a treat, try the lobster. Le Swing is by the Golf Links club – with views of the evergreen golf course, it makes the perfect time to sit and enjoy some sandwiches. Deer Hunter – this elegant restaurant is an absolutely delightful fine dining location. Overlooking the golf club the atmosphere here is marvellous and the à la carte menu exquisite in taste and design.